If the border to FYROM closes, reception conditions in Athens for refugees will become unbearable! Published on January 27, 2016 in Uncategorized. Closed Tags: 2016, asylum service, athens, Balkan corridor, border to FYROM, greece, reception system in Greece. The borders along the Balkan Route are getting every day more militarized and difficult to cross for transit refugees in Greece. Since two months just protection seekers from Syria, Iraq and Afghanistan can pass the greek-macedonian border near Idomeni. Refugees of other nationalities are therefore forced to chose hidden paths and try to go to Northern Europe with the help of smugglers using dangerous routes. Many of them actually get stuck in Greece under inhuman and degrading conditions due to a lack of money to continue their perilous journey. The country is unable to cope with the steady peak in number of arrivals – i.e. last year there were more than 860,000 coming to Greece. According to recent media reports, the EU plans to practically ‘fence’ Greece in order to stop the (safe) passage of refugees. Plans include the threat to kick Greece out of the Sengen Zone if the government doesn’t improve border controls. A closure of the border along the Balkan route would lead without doubt to a massive humanitarian crisis in Greece when thousands of refugees have to stay in limbo in a country without any infrastructure which is itself hit strongly by half a decade of economic crisis. Published on June 17, 2014 in Uncategorized. Closed Tags: asylum, asylum service, athens, detention, greece, recognition rates, statistics. In a Press Release concerning the first year of its functioning (June 2013-May 2014) the Asylum Service reported that 8,945 persons applied for asylum of which most were from Afghans. Among the asylum seekers were also 430 unaccompanied minors. In first instance 926 persons received international protection status (643 refugee status, 283 subsidiary) mainly coming from Palestine, Syria, Eritrea, Sudan and Somalia. 3,674 first instance applications were negative. The recognition rate in first instance reached 20,1 % while 1,344 applications were closed for different reasons. In average the asylum procedure takes 122 days according to the Press Release, nevertheless refugees report periods of up to some months until they manage to put their asylum claim while cueing every day from the early morning. 1,162 made a subsequent claim. Many of which might have been detainees as they are reportedly often advised falsely by police officers to withdraw from their claims in order to be released sooner from detention. 1,695 persons applied for asylum from inside detention centres. At the same time 2,807 appeals were made against first instance rejections. Of 2,015 second instance decisions 86,1% were negative. Most asylum claims are proceeded in the Asylum Service in Athens (81,6%) but there are also offices in the periphery, namely in North and South Evros, in Lesvos, Rhodes as well as asylum service teams in Amigdaleza, Thessaloniki and Patras. It is still a great obstacle for all international protection seekers living in other areas of Greece to reach to one of the asylum services. Finally, a large number of asylum claims are still proceeded by the Aliens Police Directorate in Petrou Ralli, Athens. Asylum seekers in the “old system” are still waiting after years to get their claims answered while they face other kinds of obstacles with the procedures. This “two class asylum system” has been criticised since the beginning of the Asylum Service. Published on May 31, 2014 in Uncategorized. Closed Tags: afghan, asylum, asylum recognition rates, asylum service, greece, humanitarian status, NEWS, recognised refugees, renewal of papers, sans-papiers, subsidiary status. The General Secretary of the Ministry of Citizen Protection and Public Order, Mr Ath. Andreoulakos is destroying consciously and illegally the work of the Asylum Committees while he is rejecting arbitrarily the renewal of the two-year protection status (subsidiary and humanitarian) of many refugees who then end up without papers. NGOs speak of an industry of rejections when it comes to the renewal of humanitarian or subsidiary protection in Greece. The refugees who understood they had to renew their papers and who applied for that depend on the decision of the General Secretary of the Ministry. It is highly questionable if he has the expertise to take such a decision, but he doesn’t even examine case by case if the grounds of persecution in each case are still valid, instead he actually just rejects the applications and turns upside down the decisions which were taken two years ago by the Asylum Committees. Published on February 9, 2014 in Uncategorized. Closed Tags: arrests, asylum, asylum service, greece, new arrivals, statistics. The Greek Police in its most recent statistics on 2013 anounced that police and coast guard together from January to December of the same year had arrested 39.759 foreigners without papers instead of 73.976 in 2012. This is a decrease of 46,2%. From January to November 2013 “only” 955 foreigners were arrested in Evros at the land border to Turkey for “illegal entry”. In 2012 the number outreached 30,000. While there was an overall decrease in arrivals there was also a shift of migration routes from the land border to the Aegean sea. In Mytilene 3,539 persons were arrested from January to November 2013 compared to 1,101 in the year before. On Samos island 2,914 were arrested in 2013 compared to 884 in 2012. In total 10,481 persons were arrested in he Aegean for “illegal entry” compared to 2,960 in 2012. The largest group among the 39,759 arrested in Greece in 2013 are ALbanians (14,366), followed by Syrians (7,665), Afghans (5,960), Pakistani (3,744) and Bangladeshi (1,398). Furthermore, from August 2012 (start of operation Xenios Dias) to the end of 2013 34,808 persons (either through IOM “voluntarily” either in deportations carried out by the Greek police and sometimes in cooperation with Frontex). In 2013 26.186 persons were returned compared to 22.117 in 2012 – an increase of 18,4%. In 2012 40 persons were returned to Greece based on Dublin procedures from other EU-countries. According to the president of the Service the Athens office takes 40 asylum applications per day while another 10-20 are taken in the other offices (Orestiada and Alexandroupoli / Evros, Rhodes and Mytilene / Aegean. Mobile units also work in Amigdaleza prison and in Thessaloniki. More offices are planned in Samos, Chios, Heraklion and Patras.). The backlog which is still proceeded by the Aliens Police in Petrou Ralli has been decreased to 27,000. NGOs though criticise the long queues at Katechaki street, the malfunctioning of a proper procedure to filter vulnerable cases and the insufficiency of translation in all languages. 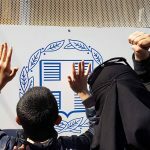 More than hat, the Asylum Service seems to be supportive and thus cooperative with the Greek Police concerning the long detention of asylum applicants. The Asylum Office states that asylum applications of detainees are proceeded within 43 days (compared to the aim of proceeded the other asylum cases in a period of 90 days). Within 7 months the asylum service which started its work on June 7th, 2013 has proceeded 5.577 asylum applications from 77 countries. The asylum recognition rate reaches from around zero for nationals from Albania and Georgia up to 99,1% for Syrians and 100% for Somalis. In average the first decision comes after 63 days. In the first stance decision from June 7th 2013 to end of January 2014 11,6% received political asylum and 5,2% subsidiary. Most of them come from Afghanistan, Syria, Iran, Eritrea and Sudan. Compared to that in 2012 the overall recognition rate was 0,9%. Currently 207 persons work for the Asylum Service. In 2013 674 persons who had applied for family reunification under Dublin III were accepted to leave Greece. Published on December 5, 2013 in Uncategorized. Closed Tags: 2013, asylum, asylum service, greece, statistics. The new asylum service reached now its first six months of functioning in Athens. Also in Fylakio, Alexandroupoli and Lesvos three asylum offices were opened meanwhile. Soon also in Rhodes (end of 2013), later in 2014 in Thessaloniki, Samos, Chios, Iraklio/ Crete and Patra asylum offices will open.